ROSEMONT, Ill., Sept. 20, 2018 — LaSalle Solutions announced today that it has been recognized as one of the top Cisco Solution Providers of 2018 by CIOReview. The Cisco special edition showcases the 20 most promising Cisco solution providers of the year. 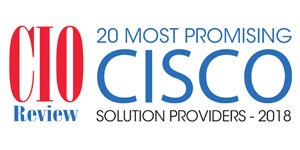 See the full list of CIOReview’s 20 Most Promising Cisco Solution Providers of 2018.